The Central Bank of Malaysia has issued a warning to the public after a bogus university certificate sporting official stamps was found to be in circulation. The certificate, which “certifies” that the holder has been awarded a degree as a “Certified Crypto Asset Consultant”, is stamped with both the Central Bank of Malaysia and University of Malaya logos, in what appears to be an attempt at fooling interested businesses or employers seeking an expert in such services. “BNM does not recognise these certificate holders who use such documentation in offering consultation services. Members of the public are advised to verify the validity of any certification programme before registering” said the Central Bank of Malaysia earlier in the week. 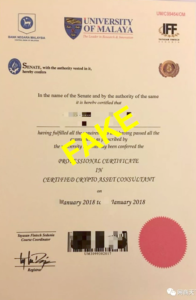 The bank has insisted that members of the public who have been presented with such certificates should verify the authenticity before entering into a relationship.